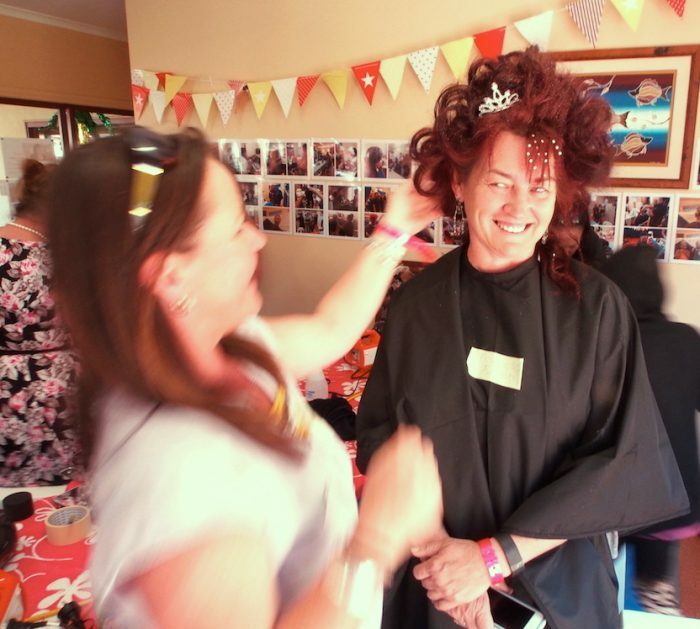 Sir Madam Salon is an interactive social change hairdressing event. We invite people to enjoy styling each other’s hair and be part of the salon chatter about fashion, art, culture, gender, wellbeing and remote Australia. Recently Sir Madam Salon featured in the Broken Heel Festival, in the gorgeous outback heritage city of Broken Hill. This festival celebrates the 21st anniversary of the iconic Australian film Priscilla Queen of the Desert. Hosted by Maari Ma Health Aboriginal Corporation, we transformed a former medical clinic into a salon and invited both visitors and Broken Hill locals to join us in a playful hair party. Thank you to everyone who came and helped make this such a delightful experience. In between putting hair diamantes on everything that moved and selecting your drag names, you helped create connection, transformation and new perspectives. Sir Madam Salon is a joint social change hairdressing project by Mel Balkan, Ben Fox and myself. Want Sir Madam Salon at your next event? Contact us to find out more. Sir Madam Salon was presented at Broken Heel with support from Maari Ma Health Aboriginal Corporation and the WA Department of Culture and the Arts, and product sponsorship from luxbc. Special thanks to Paula Fletcher, Carly McAllister and Ellenmary Potts for their elegant assistance in styling and design.